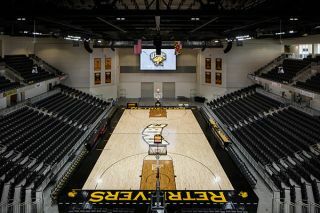 The new $85 million UMBC Event Center is the new home for indoor sporting events at the University of Maryland, Baltimore County, and in addition it serves as a flexible venue for hosting concerts, convocations and graduations, trade shows, and other events. About 4,700 fans are accommodated for UMBC Retrievers basketball and volleyball games, with uniform audio coverage and “pump ‘em up” power supplied by a distributed system based on Meyer Sound’s new LINA line arrays. The new Meyer Sound LINA system is the centerpiece of a complete AV package designed and installed by Baltimore-based Design & Integration. According to project engineer Kevin Barrett, his company worked with university technical and managerial staff to come up with the optimum, long-term solution for a house reinforcement system. The thorough system selection process also factored in the university’s prior experience with Meyer Sound LEO Family line array systems. The new system is anchored by five arrays of eight each LINA loudspeakers for coverage of the U-shaped main bowl. Three 1100-LFC low frequency control elements supply convincing impact for deep bass effects, while two UPQ-1P loudspeakers are flown as court fills. Two GALAXY 816 networked processors handle overall system drive and optimization. Although owned by the university, the UMBC Event Center contracts with the Oak View Group to handle venue operations and outside concert and event bookings. Frantzer LeBlanc, Oak View Group’s director of events and operations at UMBC, said he is pleased with the power, clarity, and versatility of the house audio system at his disposal. “The major touring acts that play concerts here will carry their own production, but we’re delighted with the way our house system is taking care of everything else,” said LeBlanc. “In addition to UMBC Retrievers games we’ve hosted community church services, well-known speakers, martial arts competitions and trade show events. The performance has been really, really good for all of them. The sound conforms to the bowl in a way that gives a sense of intimacy despite the size. We also really appreciate how easily and effectively we can zone the system to cover only designated seating areas when we’re using part of the arena." Although specifying a highly compact line array system for a mid-sized auditorium may seem somewhat audacious, Design & Integration’s Kevin Barrett said he was confident of the outcome. The full AV installation provided by Design & Integration also includes an Allen & Heath digital mixer with D-Live control surface and MixRack engine. A QSC Q-Sys network backbone ties together the arena bowl system with all back-of-house systems. Design & Integration also supplied a comprehensive broadcast cabling system, distributed CATV video systems, and both wired and wireless production intercom systems. Located on a hilltop campus in Catonsville, about eight miles from downtown Baltimore, UMBC has a total enrollment of over 13,000 students. The university’s Retrievers athletic teams compete in the NCAA Division 1 America East Conference.